At many of the show games for Gruntz I have been playing with the activation cards. They add a dynamic feel to the game with less of the I-GO-U-GO feel. They also allow for games with more than 2 players because the activation sequence is determined randomly by assigning cards, so players feel like they are involved rather than waiting their turn. 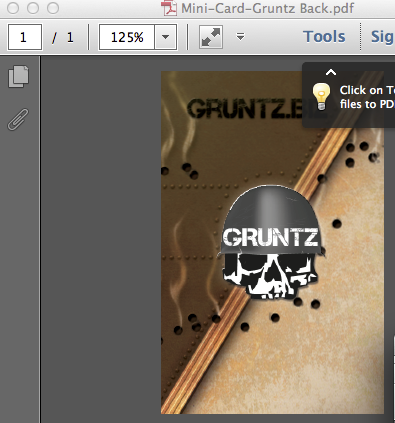 To support this play style I have been developing a dedicated deck of 62 cards for Gruntz. They are a smaller half poker card size, so ideal for the 15mm scale where you don't want to ruin the table by having a larger poker deck strewn across your terrain layout. Here is a sample of the draft card back and a couple of the card fronts. There are around 20 of the 62 cards that have some sort of special result for the unit which adds a bit more chaos to the battlefield. These abilities could be ignored if you just want to use the cards to determine activation sequence. Using these rules result in a card being assigned face down to each unit on the table (or vehicle) and when they are turned face up you can determine which unit activates by the number on the card. The highest number activates first and then you work back down to the lowest. They are heading off now for printing a draft proof set of cards and should be available to order in the next 6-8 weeks (once any final layout and rule tweaks are adjusted). Just curious, but what didn't you put special abilities/random effects on all the cards? Cool. I like both the cards and the random affects.